How many martial artists across the globe will tell you the endless number of ways in which they’ve been inspired by Jackie Chan? Too many to possibly count, but Eric Jacobus will go a step further and tell you how he’s made a career out of that! Inspired by Jackie’s mix of pulse-pounding action and laugh-out-loud comedy, Eric co-founded The Stunt People in 2001 in his quest to make the same kind of kung fu comedies in the West. In the fourteen years since, The Stunt People have released the acclaimed action-comedy “Contour”, teamed with former Power Ranger Johnny Yong Bosch for the thriller “Death Grip”, and released a slew of action-packed short films on YouTube, including the hilarious “Rope-A-Dope” films. Along the way, Eric even went on to land the role of Kurtis Stryker in season two of the popular web-series “Mortal Kombat: Legacy”! Today, Eric takes KFK through the history of The Stunt People, offers advice on getting your start as an action filmmaker, and gives some behind-the-scenes glimpses of some of the bigger projects he’s been involved with, including a knife fight he designed for “A Good Day to Die Hard” that ultimately didn’t make it into the final film, and the original ending of “Mortal Kombat: Legacy”! Brad: Hey, Eric! Thanks for taking some time out to talk with us today, I hope all is going well for you! Hey Brad, I’m doing great today! Awesome! So, let’s start off with some basics if we may. When were you born? Sure! I was born on March 29th 1982. Awesome! So, when did you first get started in the martial arts, and what different arts have you studied? I did a bit of karate when I was about 12, but I left because I ended up in the toddler class (laughs), and up until I was 20, I really didn’t have much martial arts experience, although I was a gymnast. I was pretty good on the floor, I was a rings guy, and I did some diving in college, so I actually got the acrobatics before I even got into martial arts, and that made the transition into stunt work more easy, and I’d also been weight-lifting since I was 13, so I was a very physical kid. When I moved to San Francisco for film school, I just opened up a phone book and started going down the list of martial arts schools, and the second one I found was a Taekwondo school where Andy Leung taught. He became an early Stunt People member right away because I told him I was making movies and we instantly bonded over that. Later on, I started doing Hapkido under Dennis Ruel and Ray and Troy Carbonel in 2004, and I’ve been practicing both ever since. Dennis was also a great addition to The Stunt People, because he brought in a whole group of guys like Troy and Ray, and he’s really good at acting while fighting. As a stunt performer, there’s a tendency to focus on the moves, and you may lose sight of whatever character you’ve got, and Dennis had this way about him where he didn’t fight like he was practicing, he fought like he was actually in the movie, and we were all really inspired by that, and that really brought up our game. So how did you actually first form The Stunt People and get started as an action filmmaker? Well, I grew up in the 80’s, when there was a large surplus of great action movies, and great comedies, as well. I also grew up on Vaudeville comedies, and we had a lot of VHS tapes of Charlie Chaplin and Laurel and Hardy, which I watched obsessively. I was the only kid at my school who could quote Laurel and Hardy (laughs). 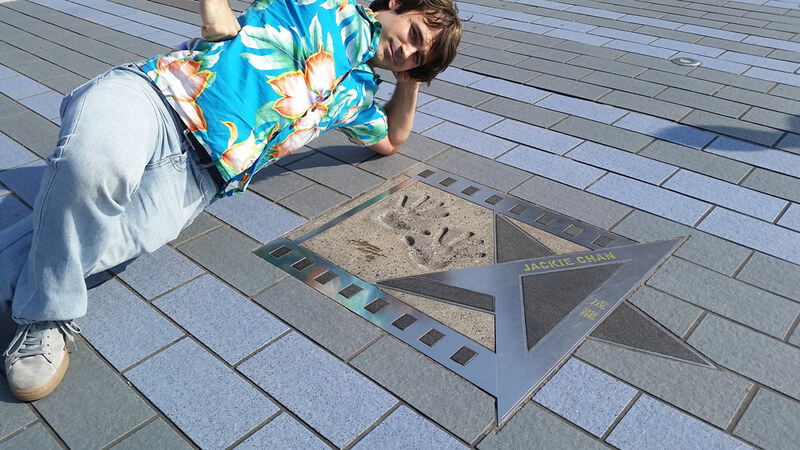 So that combination of the Vaudeville comedies and the 80’s action movies with guys like Van Damme really made me want to do something like that, and later in life, I realized there was already somebody out there doing that kind of action-comedy, and that was Jackie Chan! Amazing! So how has The Stunt People evolved since its beginning in 2001? Originally, we started out as a production company, and it was this family of guys at the beginning. Sometimes, there’d be three of us filming, and we’d all want to be in the fight, so one of us would hold the camera while two of us fought, then one guy would be kicked off camera, we’d give him the camera, and the next guy would come in. It was really barebones filmmaking, and our first feature film “Contour” was even that way a lot of the time. Over the years, we’ve transitioned more into a team that does stunts, and we get hired onto projects and possibly put the logo on the movie, depending on what the deal is. My business partner Clayton Barber and I are also forming our own company that will serve as the backbone, and essentially we hire a production company to handle the filmmaking part, and The Stunt People serve as the stunt team. 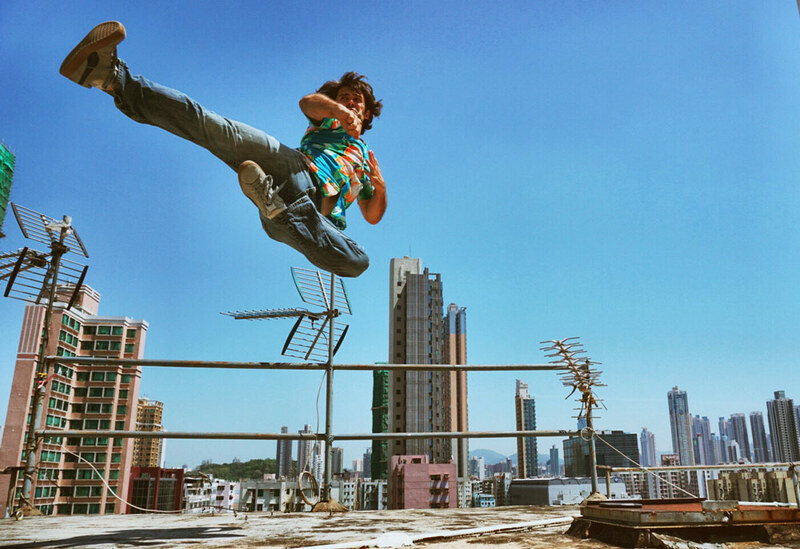 So The Stunt People is becoming not so much about filmmaking and much more about bringing martial artists and acrobats into the film industry and fostering those talents. Nice! So, what advice would you give to martial artists who aspire to become stunt performers or action filmmakers? That’s the number one thing people ask me, and the simple answer is you’ve got to learn how to make a movie. Fortunately, now it’s really easy to do that, because everybody’s got a camera, either Go Pro or on your cell phone (I’d love to do a seminar some day on How To Make an Action Movie on Your Phone!) With things like Instagram nowadays, if you get a crew together for just a day, you can get yourself on camera doing some cool stuff like falls, kicks, and flips, and make it look like a movie, even if it’s just fifteen seconds long. And if you combine that with whatever your best gym material is, now you’ve got a reel. It really does depend on your goal, too. If your goal is to be a stuntman, then your reel is your goal. If your goal is to do what Dennis Ruel and myself are doing, then you’ve got to learn how to make a movie, because nobody is going to take you and say; “OK, you’ve never made a movie, but I’ve got a plan for you, I’m going to make you a star!”, it doesn’t happen that way. Nobody will do that for you, you’ve got to do it yourself, and show that you’re marketable. And today, there are so many tutorials and free classes on how to make a movie that it’s kind of hard to avoid. YouTube and social media have given so many people a platform to make a short film and put it out there. Absolutely. Before YouTube, man, it was tough! In the 70s or 80’s, if you wanted to be an action star, you had to fight in the ring, you had to have someone notice you, and a handful of guys would get pulled out of there. A lot of stunt guys back then came out of the taekwondo, karate and kickboxing circuits, and if you had a really good persona like Van Damme, you could become a movie star. Definitely! So what would you say are some of the challenges that you and The Stunt People encounter when making movies? Time, which didn’t used to be as much of an issue because there was nothing at stake. When we did “Contour”, our executive producer just said, “OK, Eric, here’s $5,000, go play!”, and I said, “Well, I don’t really know how long we’re going to take”, and he just said, “Whatever. We own the movie, so just go make it”, and we probably spent 120 days shooting it, and those days might have been three or four hours long, so we got to spend a lot of time making the action as good as we could. But now, for example, with “Rope-A-Dope 2”, the whole end fight we shot in one day. Back in the day, I could not imagine putting everyone’s feet to the fire like that, where we would have spent two weeks doing a six-minute fight. 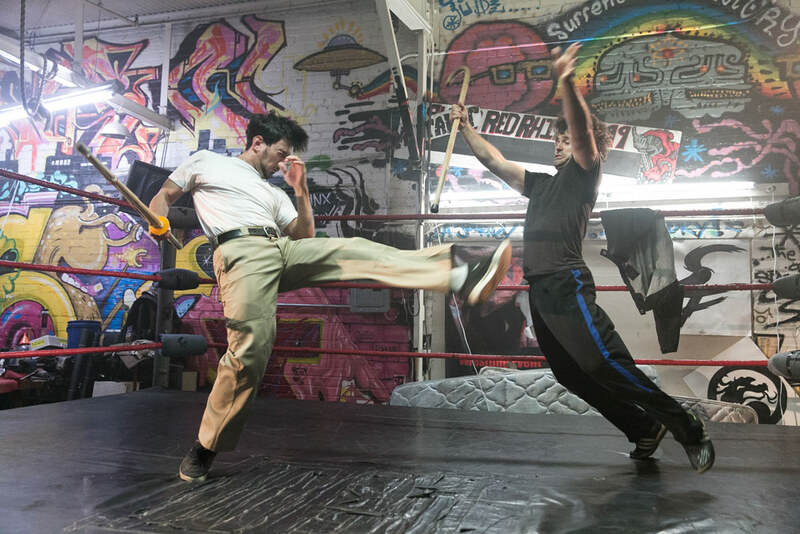 On a Hollywood production, filming a three-minute fight in one day is pretty standard because they’re filming 30-second chunks of the fight from multiple angles at once. We’re not shooting coverage like that, so we must have done seventy or eighty setups that day, but everybody came together and we pulled it off. Did anybody get hurt that day? Yes, Dennis ripped his hamstring, but you wouldn’t know it. He’s just one of those guys who says, “The show must go on”, and I was never going through the footage thinking, “Oh, no! We can only use one of Dennis’ kicks here”, everything he did came out great. That’s the value of working with really dedicated people. The same with Clayton, if we ever needed him to step in and direct, he was able to, and now he’s doing the fight choreography for “Creed” with Sylvester Stallone. Wow! Now I’m even more excited for that! So how is making shorts like “Rope-A-Dope” different from making a feature film like “Contour”? Well, “Death Grip” had a very similar kind of schedule, where we’d have to do a whole fight in one day. With a feature film, the stakes are higher, because there’s just a bigger sum of money to it, and you’re looking to make money from it, so that’s going to kind of guide your decisions. With a short film, you get to play around a little bit more. We didn’t put “Rope-A-Dope 2” out to make money off YouTube, the goal was to make the best short we could, so that we could make another feature film. And the next feature film we’re making is going to be the biggest one we’ve ever done. It’s not exactly continuing “Rope-A-Dope”, but it is in the vein! So, what would you say is your personal favorite project the Stunt People have done so far? Is it a cop out to say “Rope-A-Dope” 1 and 2? (both laugh) I’m very proud of both of those because they were very ambitious, it wasn’t just us going out on a weekend to film them. We got everyone together, we had a budget, we had a time constraint, and put them in film festivals. It was a first for us on so many fronts. Well, looking a bit into the past now, tell us a bit about the making of The Stunt People’s first feature film, “Contour”. Yes, I remember “Contour” being about the time I heard hearing about you in around 2006, and of course, it’s come a long way now to where you have a presence at the San Diego Comic-Con every year, and over the last few years, you’ve even been a part of Ric Meyers Kung Fu Extravaganza, with Cynthia Rothrock as well. How did the Stunt People first get a presence at ComicCon? ComicCon has been a tough nut to crack. We first exhibited in 2004, and the first few years we were there, people were really curious about our projects. Independent film was more novel back then, and ComicCon was much more about smaller companies, even as recently as 2007, which was when we had our best sales ever. The networking at Comic-Con also makes it worthwhile. One year, I met Larnell Stovall and he eventually choreographed “Mortal Kombat: Legacy”, and I was in it. Another year, I met Johnny Yong Bosch, and called him up later, and he was in “Death Grip”. These days, though, booth costs are going up, and we may not exhibit there this year. People are going there these days more for the really big stuff, and kudos to Comic-Con for attracting really big vendors now, but a lot of the littler guys are having to leave, and that’s nobody’s fault, that’s just the nature of it. To give you some context, every year, I used to walk away with around two hundred business cards from other people, but last year, I only got ten. There just aren’t as many people going to Comic-Con for networking, it’s a much more consumer-oriented affair. We actually did half of our sales last year at Ric Meyers’ panel after showing “Rope-A-Dope” for the second year, and it made me think, “Why am getting a booth for $2,100 and all the other costs when I can just make all of my sales here in a half hour?”, so we may take that approach with ComicCon going forward. You took the words right out of my mouth! The ‘making of’ feature on “Death Grip” gives the background on how you met Johnny Yong Bosch and how he became the villain in “Death Grip”. Could you describe the origins of the film and having a former Power Ranger as your villain? That was pretty simple. I just remembered I had met Johnny at Comic-Con, and I just emailed him about being in the film, and he said he’d do it. 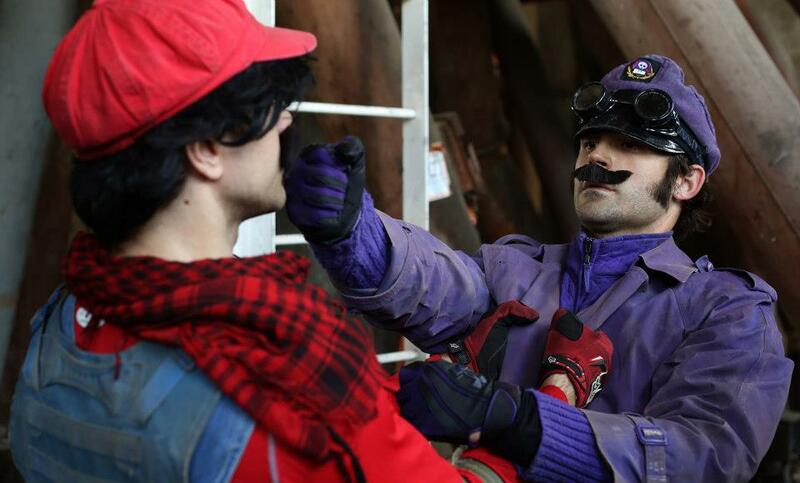 We also did a fight scene for the film’s Indiegogo campaign, and people really liked it a lot. He was really cool to work with, he always has a lot of history to share about his “Power Rangers” days and Alpha Stunts, and also “Extreme Heist” and “Broken Path”. Unfortunately, we didn’t get to do everything I’d wanted to do with our end fight because I did a table fall, landed on my shoulder, and it just jacked me up. We did the fight in two days, and we didn’t rehearse any of it, it was all on the spot. Well, going back to what you said earlier about The Stunt People branching their services out, one of the videos on your YouTube channel is a Krav Maga knife fight scene that was supposed to be in “A Good Day to Die Hard”. How did The Stunt People become a part of the film, and why didn’t that scene make it into the final film? 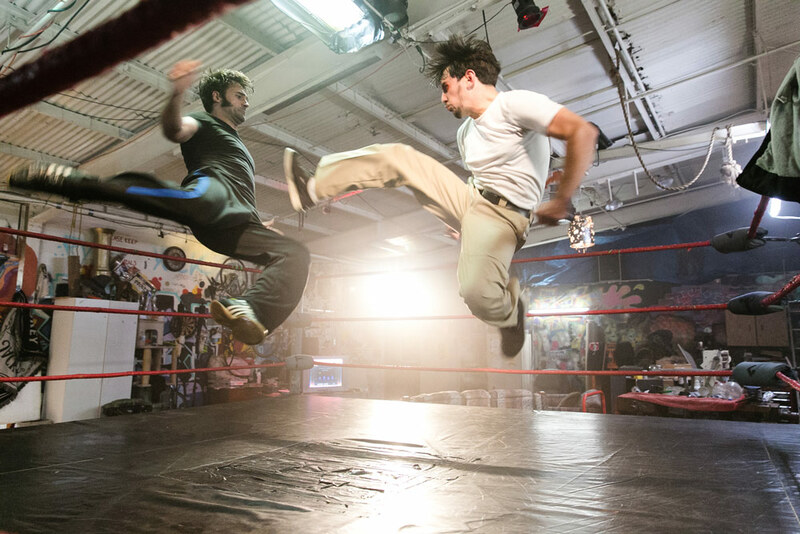 Part of the goal and the payoff of doing “Death Grip” has been getting other gigs, and one of the scenes in the film that’s led to that was the knife fight between Alvin Hsing and I. It was probably the hardest fight scene I’ve ever done in my life, but it totally paid off, because it’s what J.J. Perry saw, and he and Chad Stahelski hired us to come do the knife fight for “A Good Day to Die Hard”. We worked for five days in the 87 Eleven gym choreographing the fight. Glad that worked, it’s an awesome knife fight! There’s also another YouTube video you did recently that got a lot of attention called the Kicktionary. How did that come about? There’s no other Kicktionary is really the answer. (both laugh) It’s why we did our first person Darth Vader videos, because no one had ever done a first person lightsaber fight. The problem now that I’m trying to do a part two is that, now I’ve gotta do the hard kicks! So, how do you keep all of your videos on YouTube feeling fresh and new? I have the fortune of working with very creative people. Our video “Wake up Juice” actually wasn’t my idea, it was Brad Kelly’s. Not all of the videos I put up on YouTube are actually my creation. For example, “Sensitive 70’s Turtleneck Tough Guys” was Jose Montesinos, and I asked if I could put it on my YouTube channel, and he said yes. A big part of it is just surrounding yourself with a lot of people with good ideas, it doesn’t have to be my idea. Absolutely! 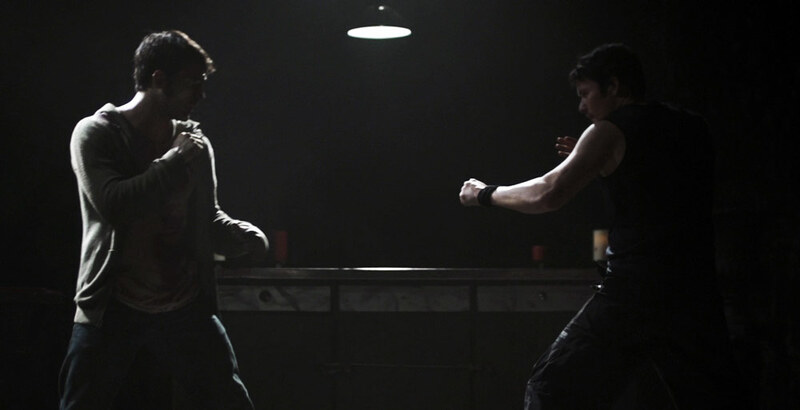 Well, that brings us now to your involvement in the second season of “Mortal Kombat: Legacy”. You mentioned running into Larnell Stovall at Comic-Con as the genesis of how you came to play Kurtis Stryker in the series. Describe the experience of being a part of a franchise with such an enormous fan base worldwide. Boy, do we have a time limit? (both laugh) I was the kid who would ask my mom for a Mortal Kombat arcade machine for Christmas. Mortal Kombat was the first fighting game I really liked, and so I was totally stoked to play Stryker, and then to be making it with people like Mark Dacascos, Casper Van Dien, Dan Southworth, it was double nerd heaven! Working with Casper was awesome, he’s hilarious and he was perfect for Johnny Cage, and he did most of his own fighting. We’d choreographed the final fight with Brian Tee, who played Liu Kang, and it was me and Mark, who played Kung Lao, taking on Liu Kang. It was also outside of the cave that was the Batcave in the 1960’s “Batman” TV series, so that was triple nerd heaven. So we had this long fight planned out, we were filming in December of 2012, and we were working against the clock because we were starting on it at 3:30 pm and the sun is going down at 5 pm, and the director Kevin Tancheron comes up to me and says, “We’re not going to be able to do the full fight, only about twenty percent of it”, and I just told him that there will be disappointments all the time, and that’s totally fine, which is something I’ve gone through with my own projects. But I put the footage all over my demo reel! That’s a brilliant story! Hopefully, we’ll see that full end fight eventually, especially after the cliffhanger ending of season two! Is there any other Mortal Kombat character you would like to have played if you hadn’t played Stryker? I probably wouldn’t have made a good Jax, but maybe Sindel! (laughs) Stryker’s cool because he’s the human, and he was right in line with what I really liked, the guy who brings a gun to a fireball fight. Speaking of nerding out, if you could be a superhero or have one superpower, what would it be? I always liked Batman, and I like Iron Man, too. I don’t think he really got a fair shake until Robert Downey Jr. came along and made a funny superhero. The thing about Batman and Iron Man is that they’re people underneath their tools, and they have to rely on items for their superpower. They’re just really smart guys, so they have to think through their problems, and I really like that. Nice! So can you tell us what are some of the worst injuries you’ve suffered over the course of your career? The worst injury I’ve ever had actually wasn’t even while making a movie, which is the worst part, because I didn’t get it on camera! It was a herniated L5 disc in my spine. It was so bad, I can’t even remember if it happened in ’03 or ’06! I was just doing a front flip in the gym, and herniated the disc. It caused sciatica in my right leg, and I had to sleep on the floor for six months. I went through unbelievable amounts of physical therapy, and I thought my career was over. Finally, I got a back brace from Uline, and it kept my spine aligned, and after two weeks it was back to normal. I would definitely tell people to please get a back brace before spending thousands of dollars on a chiropractor. The worst injury I’ve ever had actually making a movie is probably between my shoulder injury during the fight with Johnny in “Death Grip”, which definitely “changed” my shoulder, and I’ve been recovering from that for almost four years now, and I did a fall through a roof once and landed on my ankle. But I haven’t broken anything yet! 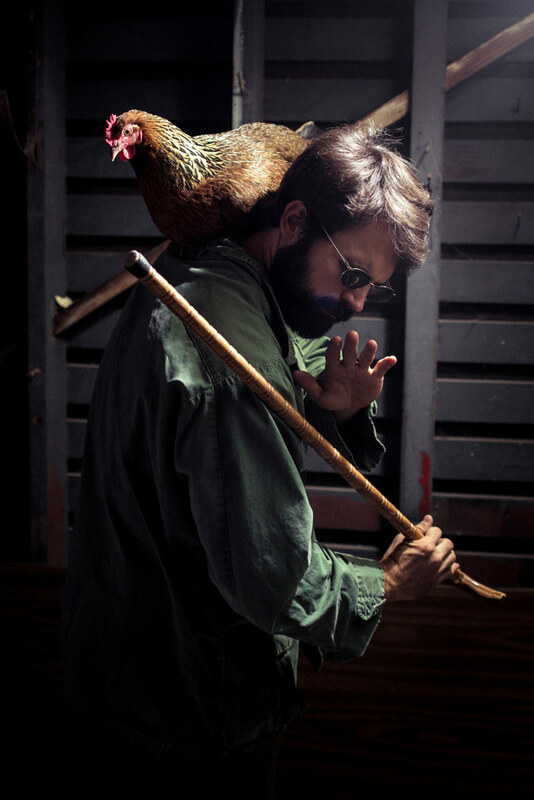 I have nothing to fear with my cane and seeing-eye rooster by my side! Gee, (winces) that back injury sounds brutal, and that kind of leads into my next question, which is, what do you think are some of the most common misconceptions about action filmmaking? Safety first, definitely! Moving now into other work you’ve done, you were previously Operations Manager for an organization called The Seasteading Institute. How did you first become involved with them? Describe the experience of working there. I heard about The Seasteading Institute on the weekly Econtalk podcast (I have side interests y’know) and I offered to volunteer there but ended up getting a full time job out of it. That was a cool gig with an awesome cause and I formed a network of peers around that place. Lots of them have even become instrumental in my film work. I still keep in contact with all of them. 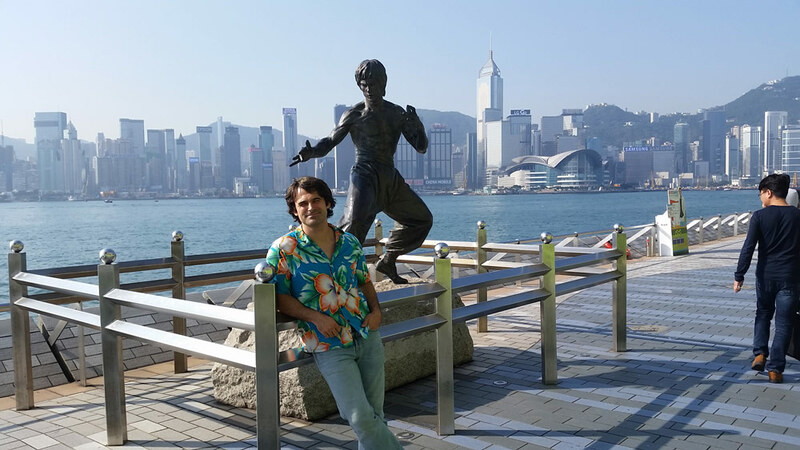 You’ve also had your picture featured in several issues of Kung Fu Tai Chi Magazine. How did that come about? That happened through Tiger Claw, who is the official sponsor of a lot of The Stunt People things. They sponsored “Death Grip” and “Rope-A-Dope 2” with all the weapons we used, and they’re going to sponsor me with my training videos and training equipment, and I can’t wait to work with them in the future. They have every weapon known to man, like the cane the Dope uses. 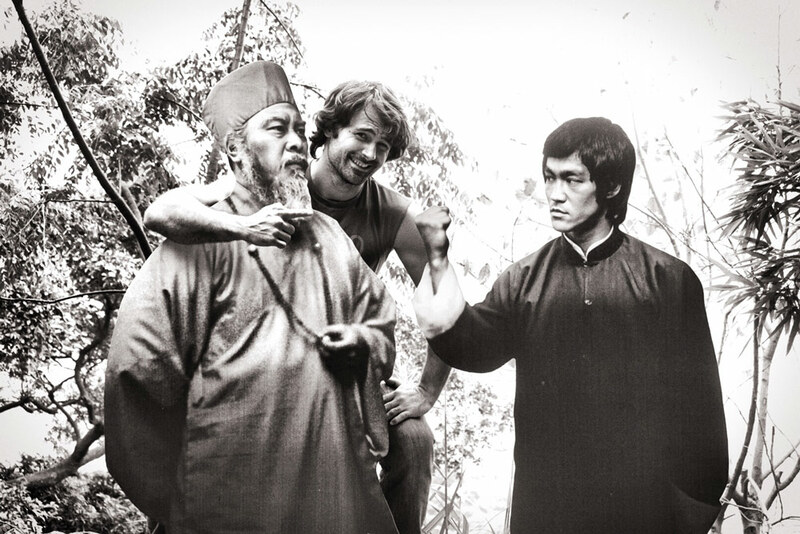 So who would you say are your heroes or people who really inspire you in martial arts? Jackie Chan, obviously. I would say Jackie is my number one inspiration. There’s also guys like Donnie Yen, Sammo Hung, and then in America, Van Damme. In the late 80’s and early 90’s, martial arts was very simple, and people were really blown away by a good jump spinning kick, and if you could do that kick and put on a good face, you could be a movie star. The ability to bring a persona like that to martial arts is a great skill, and Van Damme did that, and so did Jackie Chan. 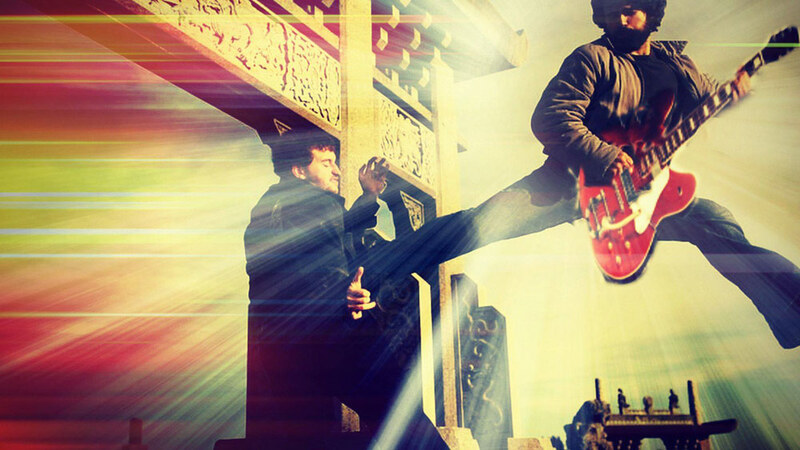 What would be your top 10 favorite martial arts films? “Mad Monkey Kung Fu” for my favorite Shaw Bros film. “Big Trouble In Little China” is our best martial arts film here in America. All classics across the board! Looking at martial arts training now, what are some of your favorite styles in martial arts or different aspects of martial arts training? I love Taekwondo for the counter-kicking, and I love Hapkido for the angles of kicking. 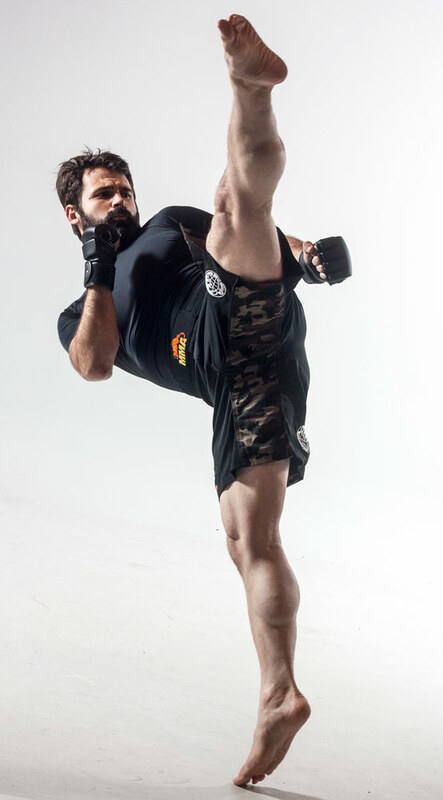 The way Dennis teaches Hapkido has a lot of interesting angles for kicks. I’ve never studied Kali, but I really want to and I love the philosophy behind it. I also have a lot of respect for Krav Maga, and Boxing. I’m not very good at it (laughs), but I love watching it because there’s something very pure about it. Wonderful! What is a typical week for you as far as training goes? If I’m not scripting, I try to weight lift three days a week, and one of those days is dedicated to squats and deadlifts. When it comes to stunt training, which I try to do twice a week, I usually spend an hour or so playing with kicks. What are some of your personal likes/dislikes? I hate mustard. I can smell it across a restaurant, keep it away! Other than that I’ll eat anything, especially tendon and tripe. I love a good White Russian, going to the Richmond Rod & Gun Club and shooting the shotgun with the wife. I’ve got a big box PC game collection, I have a thing for Laserdiscs, and I’ve recently been eating up Rene Girard’s books, which are required reading for screenwriters. And “Black Mirror” is the best science fiction in recent history. So, moving forward through 2015, what are some of the plans you and The Stunt People have? I’ve got three projects in editing, and those will be released on YouTube in the coming months. 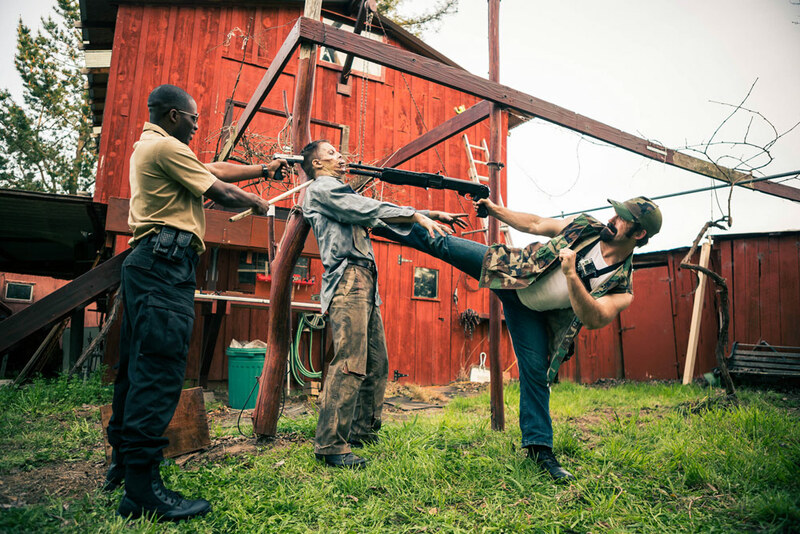 One is the long awaited “Zombie Defense 101” where I teach people how to fight a zombie unarmed. I’d also like to do a “Beard Off 2”, and Clayton and I are working on one that will be an homage to a very famous fight scene, and we’re starting on that as soon as he finishes up with “Creed”. What would be a favorite warrior wisdom quote of yours? Most excellent choice! Well, as we sadly get ready to sign off, what message would you like to leave for Kung Fu Kingdom readers? If you want to do what I do, then just start from the bottom and work your way up. It’s doable for anybody. It took me twelve years full-time before I got a gig like “Mortal Kombat”. Boris Karloff acted for twenty years before he played Frankenstein. I think it’ll get easier because of social networking and the internet, but you have to keep at it. Timeless words of wisdom! Where can visitors reading this find out more about Eric Jacobus and The Stunt People? It’s been a pleasure and a privilege, Eric. Thanks for your time today! Great speaking to you, Brad! Thanks so much to you and your team at Kung Fu Kingdom for the opportunity!